day with our usual method. Please send us a price for more. John Urick, Guidant Corporation, Minnesota. loads very well and most of all, the operators love it. Thank you for implementing our special requests. that will help us to improve our performance. bearings played a huge role. compared to the same job last year. 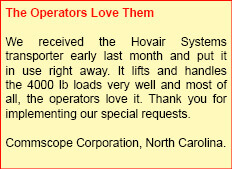 Hovair Systems that stand out and are appreciated. healthy sense of urgency to meet commitments. complaints. They’re a great group to work with. Lockheed Martin Corporation. Fort Worth, Texas.